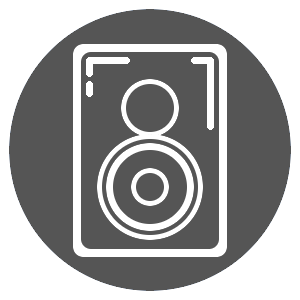 The Sub 500 is the perfect complement for ambitious multi-channel systems or two channel stereo systems where deep and dynamic sub-bass is coveted and true Dynaudio sound quality is desired. A 12" woofer, featuring a die-cast aluminum frame, is integrated into a metal baffle in a sealed cabinet. Mounting the driver to the cabinet follows Dynaudio's established design principle where a multi-layered sandwich construction is employed: Fusing the thick, stiff metal baffle to the MDF enclosure is a sheet of special dampening material. This construction effectively eliminates any unwanted resonance and serves as the perfect foundation to optimize the fast and powerful transient signals from the driver. It is powered by a 250 Watt amplifier utilizing the innovative Dynaudio CEC (Cone Excursion Control) technology, and features full remote control operation of all adjustments: Selecting level, phase, cross-over frequency, extended bass mode, and the four individual memory presets. Its back panel is outfitted with both RCA and XLR inputs and outputs, the master/slave switch, as well as the memory protect switch. The subwoofer driver may be concealed from view by the elegantly sculpted removable black fabric grill, which is itself attached to the baffle via concealed magnets. Specification sheet for Sub part 2Frequency Response:18 – 250 Hz (± 3 dB)Amplifier Power (min. ):250 WLow-Pass Filter:Flat / 60 / 80 / 100 HzPhase adjustment:0° / 90° / 180° / 270°Specification sheet for Sub part 1Input/Output:RCA / RCA / XLR (balanced)Box Principle:SealedWeight:30.6 kgDimensions (W x H x D):360 x 378 x 568 mm 14.2 x 14.9 x 22.4"